BACKGROUND: Yellow starthistle originated in the Mediterranean area and Asia. It spreads exclusively by seed, which may lie dormant for as long as 10 years. It causes “chewing disease” and death in horses. Yellow starthistle will grow wherever downy brome (cheat-grass) grows. 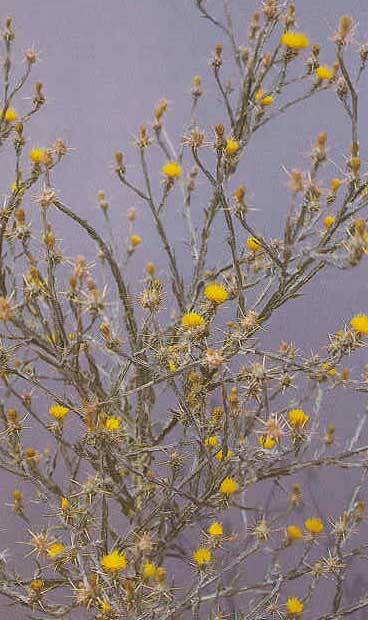 DESCRIPTION: Yellow starthistle is a winter annual maturing from 2 to 72 inches tall. A rosette of deeply lobed leaves up to 8 inches long forms after seed germination in the fall. Stem leaves up to 4 inches long develop in early spring, their blades forming fringelike extensions on the stem. Yellow flower heads develop at the tips of branched stems from late spring until fall. Flower head bracts bear stiff, sharp thorns 3/4 inch long. Seeds are tan with white and brown mottling, 1/8 inch long; both plumed and unplumed seeds develop in each flower head. Plumed seeds are not highly windborne; unplumed seeds not at all. DISTRIBUTION: Yellow starthistle is widely scattered throughout the U.S., but is a severe problem only in the West. CONTROL: Three seed head weevils and 2 seed head flies have been good to excellent biological control agents in Idaho.